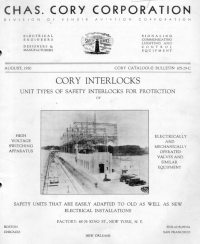 Superior Interlock Corporation has, for decades, been safeguarding the lives of personnel and protecting valuable equipment and processes in industrial facilities all over the world. Circa 1920 The D.P. Robinson Company pioneered several rudimentary interlock devices which it marketed and sold under the trade names Robinson Interlock and Cory-Robinson Interlock systems. Bendix Aviation Corporation subsequently acquired these systems. In 1946, several of the engineers involved with Bendix Aviation expanded the line of key interlocks and formed The Superior Interlock Corporation. Pictured above left is the 1930 catalog cover from the Chas. Cory Corporation, a division of Bendix Aviation Corp. Above right is an illustration of an early key interlock device mated to a Westinghouse breaker. 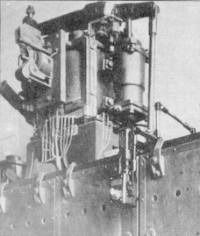 Early on, key interlocks were primarily applied to protect switchyard equipment such as overhead disconnect switches and oil circuit breakers. Due to their inherent flexibility; however, key interlocks have come to be applied to a wide spectrum of industrial equipment and processes ranging from robotics to fluid control devices. In an age where safety, liability, and federal regulations are paramount concerns in industrial endeavors, the application of key interlocks serves as an efficient solution in addressing these concerns. We have specialized in servicing the special needs of companies with interlocking requirements for electrical switchgear, nuclear level detectors, valve products, air pollution control equipment, and any applications which require a process to be followed sequentially, insuring that personnel and equipment are safeguarded. Our engineering staff and factory personnel are ready to assist their counterparts at your facility with the planning and development of any interlock logic or hardware required for your particular application. Our goal is offering complete flexibility to our customers. Superior Interlock Corporation is located in New York City within the Borough of Queens. We employ approximately 30 employees and pride ourselves in being an active corporate member of the community. 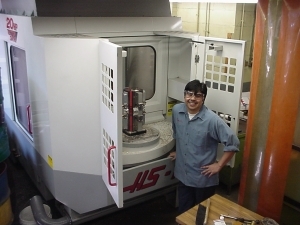 Our line of key interlocks and related components are precision machined through a compliment of horizontal and vertical CNC machine centers. As industry dictates, our quality assurance system as well as all assembly and production guidelines are configured on a strict ISO 9002 model.